Really nice light balance on the indoor photo. Nikon D200 its a very good camera, fantastic(I think)I have two of them, I have obtained amazing results with them, amazing colors and terrific white balance. If youre looking for a camera i can recomend you nikon d200. Shhh! You're not supposed to say that. We're supposed to be conditioned to believe that the newer Nikon dslrs do not give out a pinkish fluorescent unrealistic skin tone. yes it is a superb camera. Is it just me? but IMHO the colours look better from the D200 than the D300. I'm planning to upgrade my D50, not sure if I should go for the D200 or D300, but for me the colours are more important than an extra 2mpx. recommend it to anyone out there comparing even some higher megapixel Canon models. Get yourself a nice Nikkor 18-200mm DX VR and a 70-300mm DX VR lens, and a good polarizer, and you'll be set for a while. But don't just take anyone's word for it - compare some of the pictures on this site, and you will see what it can do. I upgraded from the D80 and I found out that the matrix metering is very consistent with the D200. The D80 tends to blow the highlights so I had to compensate for it a lot which took fun away from photography. Whatever some people say about the D200 compare to the D300, it still a superb camera with more qualities than the compatition. For more than forty years I´m a Nikon user. I´ve fond memories of the first F, but the best and easier to use still is D200 I own from the day it got to Porto´s F.N.A.C.It was a good improvement over D70. I have the D200 now for about a month and I'm very pleased with it. What I don't like about it are the extremely bad structured menus (I'm used to them now but that doesn't mean that they arent miserable!). Also at least one button for changing the 4 shooting banks would be very helpful. Twiddeling around through the menus for choosing the banks manually isn't really fun (it doesn't take very long, don't get me wrong! BUT...) when you want to change your shooting technique rapidely as the situation demands it from you. Well, all in all it's a great item - very quick and accurate. My apologies for the double post below ! I refreshed the screen and the thread duplicated. As well, I have no clue as to why the image appeared on the screen. I like D200 very much and it help me to get so much images in my city for lovely bird. Got my D200 last week and started working on it.Great camera..! Is the 18-200 just a great walking around lens, or is it good for portraits? And what's the difference between using 50mm with the 18-200, than buying the 50mm f1.4? If you enjoy taking pictures and wants to know how to get professional results, than you must consider this camera. The craftsmanship and features on the D200 is just amazing. The secret of a pro photographer is not all depended on their skills but also on their equipment. Here are few sample shots. Check the total number of shutter release for your D200 by Opanda IExif Viewer. Started out with a D70 which was great but had to get teh D200 after seeing the images it creates. I'm not dissapointed, despite the odd 'quirk' such as it not turning off occasionally! the camera is brilliant. Agreed with Colin. I had a D70 too and most of the pictures in my gallery are taken with it. However there is no compasrison with the D200. Its an amazing machine. I love it everytime I pick it up. My first DSLR was a D70, which changed my photography totally and I loved it! I moved to a D200 in March this year and it's even better - seems to me to offer most of the functions an amateur will ever need, but perhaps wouldn't withstand the abuse a Pro camera has to go through ;-) I often read that cameras don't make great pictures, the photographer does. That's certainly true, but a great, fast camera sure helps, especially where you need fast repeat rate, low light in good quality, etc. BTW - do get the grip - makes life much easier for Portrait shots! My gallery's half D200 and half D70 now - but sadly the D70 rarely sees the light of day any more. I recently returned from Rome with my D200. i just bought my D200 and started working on it.. Great camera.. The major investment in any digital technology may be measured in both time and money. After years of neglecting my old 35mm SLR equipment the Nikon D70 brought me back to the delights of still photography. The D200 was a natural progression, and although it is a steep learning curve the results when achieved feel well worth the effort. The new oil was still wet on the D200 when I visited the South Island of New Zealand in June-July of this Year. See Gallery if interested. Well, after the slight focusing problem I had when I recieved mine more then half a year before, I have to say that this camera is a good match for the highest pro digital cameras. It focuses fast and with pin point acuracy with all my lens, perhaps it has a slight problem in the eddges of my 17mm, that I supose it has to do with the slight chromatic aberration it has. Never the less, I am working with it as my first camera in the pro photojournalistic world and if I have to compare it with my old D-100 I have to say that now I feel quite more competitive enfront of the D1's of some of my collegues. This is a brilliant camera - I had an F100 then went to a D70 for my first digital. The D70 always felt like a let-down in terms of handling and build quality compared to the F100. The D200 has erased all that. I wan't really expecting a leap in image quality over the D70, but was pleasantly surprised. The better metering, focusing obviously a few extra pixels have made the jump totally worthwhile from an image quality perspective, as well as from a handling point of view. Coming from a D50 I thought I would be in way over my head getting a D200. But after reading a lot of threads in photography forums and learning about different settings I'm amazed how well my D200 performed after one month. Here's my 1st D200 Gallery! Hope you think it's ok. I have been shooting Professionally for the last 20 years. I have been hesitant to switch from medium fomat to digital. I purchased the D200 last month and the camera has exceeded my expectations of the digital format. This camera is proffesionaly built and produces the quality that I have come to expect from film. Remember though that no matter how good a camera is: "It is the photographers skills that make the images come to life". Excellent camera!. Ergonomically and functionally. Been using the camera for the last 6 months after using D70 for more than 2 years. this camera is everything..that nikon promised and more! The D200 is really a great camera. It even produces better quality pics than the D2H. Specialy withhigher ISO-settings. The D200 is a complicated camera, no? Great for gadget freaks like me :-). Had a play with my BIL's camera over the weekend and must say that it's easier to get nice skin tones of my baby twin daughters (even under warm, yellow lighting! - just set the WB to 2500K) than my D70 >> seehttp://www.pbase.com/image/60351424/original - ISO1600 under energy-saving, tungsten-cast lighting, just resized and sharpened. FYI, I'll be collecting and posting links to interesting tips and information on this camera at my just-launched site athttp://nikond200.dpnotes.com . This is a stunning camera. Once I had begun to master some of the settings, then the full potential began to emerge.The spot metering is brilliant and I prefer this to the matrix metering, once you have carefully selected the correct tonal area to meter. I have experimented with a small fraction of this cameras potential but have a long way to go to reach other photographer's standards as displayed in these comments.Have alook at A Taste of Oxford which I shot this week in May 2006. I love this camera - started out with the D70, and loved that camera, but now with the D200, everything is at a new level - I've taken 4,000 pics in about 5 months and have captured some great pics - with many more to come - if you are thinking about buying this camera, go do it - you won't regret your decision. Best camera I've ever owned! Images are clear, huge, and saturated. Right now I have a 50mm nikkor 1.4f lens on it and it takes beautifully crisp portraits. Camera is a MUST HAVE!!! Received my D200 a couple of days ago. Had been using a Canon 300D with success but decided that an upgrade was due. After a great deal of research decided to sell my Canon gear and switch to Nikon, partly because of the 200D and partly because I was becoming slightly disillusioned with Canon despite good results from my kit. Something to do with the inability to get real vibrancy in my images and an overall soft feeling that I found difficult to correct. The D200 is clearly a class or two above my previous camera. Initial results show a real improvement, but then this is a significant upgrade. My only observation is a philosophical one - this camera does so much that sometimes I harken back to the days of my old Canon Ai and remember what a pleasure it was to take photographs. The complexity of modern kit MAY detract from the actual pleasure of image making. Zooming here and there, adjusting settings, fiddling with this and that is all very interesting, but does it improve the creativity of taking pictures? Now what I want is a simple no nonsense lens (perhaps the 85/1.4 or the 60/2.8 micro) and then go out and about for several months with just that one lens so that can find out exactly what this camera can do. Who will on the end not buy this camera for it's performance only. My wish would have been this camera with the 6 mpix chip of the D50 or the Fuji S3 chip. The problem with pixel race is that the more you have, the finer and sharper the picture gets on one end, on the other you suffer from noise problems and bad light conditions. i can't realy understand how Nikon manages to take that much out of this chip anyway. It performs much better in the dark then the D50/70 series. I think that a 14 mpix full size chip had been a better solution for such a beast. Lenses get better, software for rework as well, so nothing realy could cause a problem anymore with full sized chip if lens developpement follows the trend. 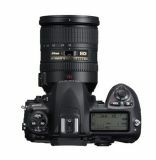 I checked the pictures of the D50/D70 and the D200 as well as the D2x. note that the D50 makes the better sharper shot, the D200 draws much softer and smooth and much closer to the film type photo. It is obvious that the basic D200 shot is based on Pro parameters and needs a rework to make it real good. I tested basic jpegs and those are excellent if the light and focusing is ok. to say that you can use all of them as such would be overdriven. All in all a fantastic performance case without any challenger yet. A better chip could make this an outperformer. I can't understand Nikon to stick to Sony for the chips while Fuji makes one that would make this camera an unbeatable object for many years. Yes, I left a comment before, I just whanted to ask a question. Has anyone had focusing problems with lenses like the 80-200 or the 300 at f-stop 2,8? My D-200 just focused like 5cm before or after but very few times were the focusing point was. I took it to Nikon service and I'm waiting for them to tell me what's the matter with it but I was wondering if it is a common thing or not... I had the same problem with the F-90X and they never realy were able to solve it, and that worries me a bit. The D200 is the perfect combination of travel dslr and studio. It is small enough to fit in a small camera bag (even with the heavy 17-55 glass that lives on mine) yet has all the features that you would expect of a professional dslr. Canon 5D is also a nice camera but I personally prefer the feel, build, and weather sealing of the D200 combined with their excellent lenses. One little deception though, Since I have memory, I've always worked with Metz flashes and to my surprise, I could not youse any of them with the D200, no even in A mode!!! in the end I had to buy my self the SB-800, reason... the i-TTL, but for the Automatic? I don't know. I've got three dSLRs.... Pentax *istD, Nikon D70s and now the brilliant Nikon D200. I can tell you that you won't be disappointed by the incredible picture quality this level entry pro camera gives you. The auto white balance is spot on, even in difficult lighting conditions. The dynamic range is greater, especially in the midtones over the Nikon D70s and the colors this camera produces are very natural with true to life skin tones. The 10 megapixels gives you that extra cropping ability over a 6 MB camera. The large LCD is bright, has a great off center viewing angle and is a joy to use. The 5 fps for up to 22 RAW frames or 37 JPEGs is great for sports and action. The viewfinder is huge and the glass pentaprism gives a sharp and bright view making focusing a breeze with manual focus lenses. This is a camera that will not disappoint the serious or semi-pro photographer! i am getting amazing pictures pretty much right out of the camera, basically just set in capture the white balance and sharpening as i shoot RAW. just took these tonight, long tripod exposures, but clicked the button, so some vibration. i think these shots are amazing. they rendering of the images are so beautiful, i couldn't possibly be happier with this camera. All shot with the D200 and the Nikkor 85mm f/1.4D IF AF or the Nikkor 17-55mm f/2.8G ED-IF AF-S DX. Some early test shots. Camera recieved 12/21/05. Weather was good all week & 86 degrees Chrstmas Eve. First impressions: Wow! Looks great, feels great and my first large jeg's leap off my monitor with terrific clarity, contrast & detail. Unfortunatley, most of that cannot be seen in uploads to PBase. The true test will be my first A3+, 13"x19" and larger prints, which is why I bought this baby. The images on my site that I took with the D200 needed NO post-processing whatsoever. The B&W mode is exceptional.I am customizing the menus and will have mor eimages after the craziness of Christmas is over. Just a couple of D200 product shots:http://www.localviewfinder.com/news/page2.cfm The wireless macro ring flashes (R200) might be available 2nd Qtr 2006. A few test shots at www.pabase.com/qwntm The 1600 and 3200 ISO shots lokk very promising. Please post more Nikon D200 images and tell us your impression of the camera. Do the images require extensive post-processing OR are the images almost perfect straight from the camera?????????????????? Thanks for posting the few images that you've shared with the all the anxiously waiting Nikon fans.